I've been thinking about Veteran's Day this weekend, thinking about all the sacrifices and contributions made by men and women who have served our country. As I think about these brave veterans, my mind always turns to their families. What would it be like to have your mom or dad sent away to war? What would it be like living with the uncertainty of when or how they would return? Naturally, my mind turns to powerful stories I've read that let me feel what it might be like to live through these difficult times. Two books come to mind: Heart of a Shepherd and Dear Blue Sky. Share these books with children who want a story that touches their heart. Heart of a Shepherd has stayed with me, finding a special place inside. It's a powerful story of loss, faith and coming of age. I originally read and reviewed this in 2009 (see original post here), and it has stayed with me. 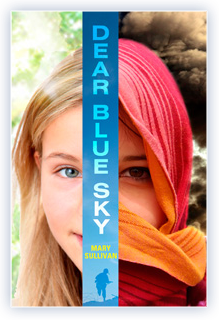 Dear Blue Sky is another heartfelt story that revolves around the pain and loss caused by the Iraqi War. I shared about this book just a few months ago, so I won't go into as many details (see original post here). But it would be interesting to read these two books together and see how the characters deal with the situation caused by their loved ones being sent away to war. As I wrote a few months ago, "I was particularly impressed with how Sullivan raises these complex issues in a way that tweens will understand - personalizing the impact of the suffering caused by the Iraq War, focusing in on family and friendship dynamics, looking closely at the impact of assumptions and isolation." The review copies were kindly sent by the publishers, Random House and Penguin. If you make a purchase using the Amazon links on this site, a small portion goes to Great Kid Books (at no cost to you!). Thank you for your support. Those 2 books look great! I am a Children's Librarian, and I just saw "Dear Blue Sky" come through as a new book, but somehow I missed "Heart of a Shepherd" in 2009. I must go back and read it. Thanks for sharing!